Dr. Marc Shapiro places great rabbinic figures in their historical context, exploring their religious thought and ongoing influence. Rav Yechiel Michel Epstein, author of the Aruch HaShulchan. The classes are free; registration is required. There will be no class on Monday night Febraury 25. The last class in the series will take place Monday March 4. Donations and sponsorships are be greatly appreciated. Donations can be made here. Thank you. You can listen to the previous 180 talks in this fascinating series here. The rabbinic greats we have discussed include Rav Shimshon Raphael Hirsch, the Chatam Sofer, Rav Tzvi Pesach Frank, Rabbi Dr. Eliezer Berkovits, Rav Shlomo Yosef Zevin, Rav Elchanan Wasserman, Rav Yitzchak Elchanan Spector, and Rav Ovadia Yosef, to name just a few. 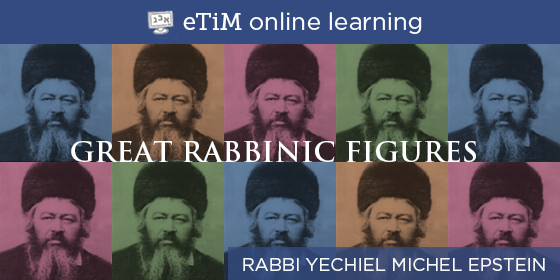 This semester's topic is Rabbi Yechiel Michel Epstein.